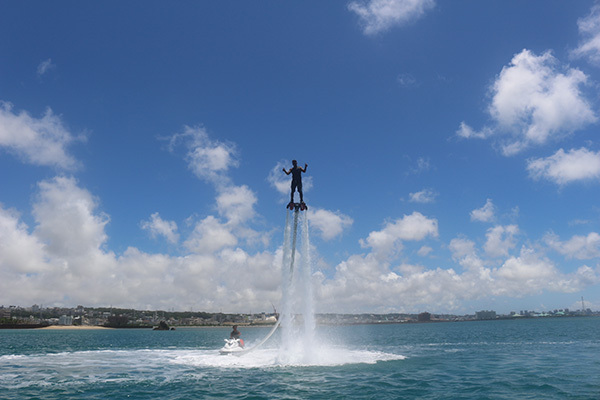 Flyboarding is a new type of marine activity that was introduced in 2012. The special equipment, a flyboard, attached to your feet allows you to experience the unique sensation of aquatic flight using the power generated by a huge amount of water shooting out of a watercraft. Since its appearance in Okinawa in 2013, the activity has been the center of attention and now, it can be enjoyed at a variety of locations around the island. 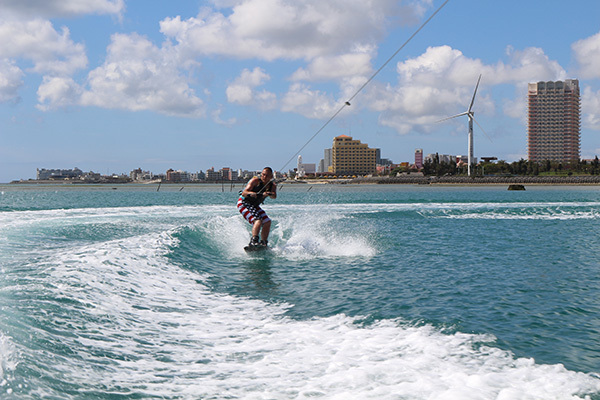 Araha Beach in Chatan Town, central Okinawa, is one of the destinations for people looking to try out this new activity. 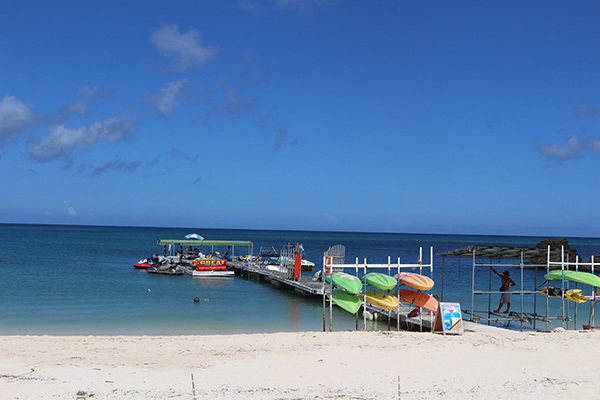 In addition to flyboarding, parasailing, wakeboarding, sea kayaking, a variety of thrilling tube rides, glass-bottom boat, sea trekking, which is a unique way to enjoy an underwater stroll wearing a special helmet, and more fun activities await you at Araha Beach. The beach is equipped with a jellyfish protection net. In addition, situated adjacent to the beach is Araha Park with playground equipment and basketball courts. The area surrounding the beach, including the popular Mihama American Village, offers a great shopping experience to enjoy before or after beach activities. Advance reservations for these marine activities are highly recommended to make the most of your beach day, especially during the period surrounding the Obon holidays, from Aug. 10-16. Araha Beach offers a fun and casual marine activity experience with the unique townscape of Mihama's coastal area in the background.